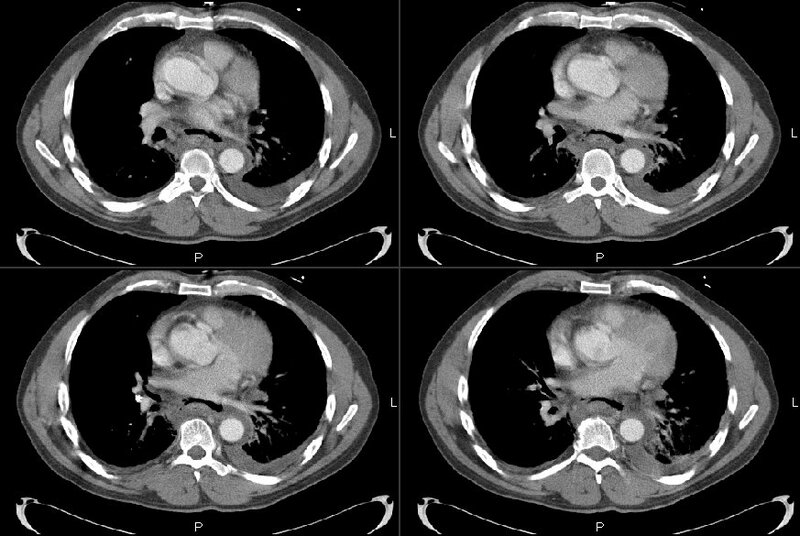 73 yo female with PMH of thoracic aortic aneurysm being followed with serial CT scans. 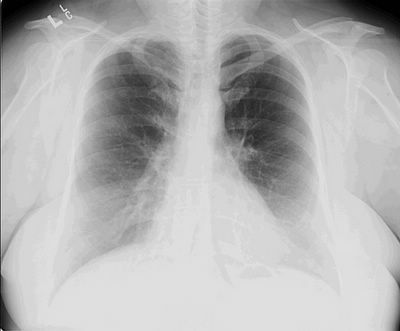 She spends the winter months in Arizona and was admitted to an OSH with dyspnea and respiratory failure. She presented with no records, so I relied on her memory (which was surprisingly good). Her hospital course was complicated by VDRF requiring about 2 weeks on the vent. A BAL of her LLL was performed and yielded (per her report) "Valley Fever." She was placed on fluconazole (unknown dose). Her chest xray showed lobar pneumonia. PPD negative at OSH; BAL neg for AFB. 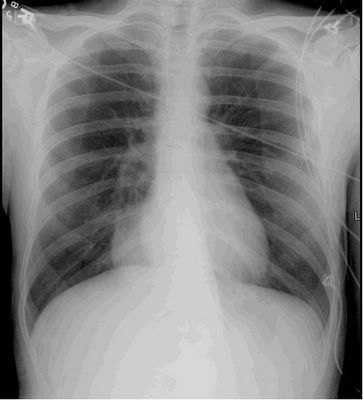 She slowly recovered and presented to my office 8 months later with dyspnea, fatigue and chest pain. She was being treated with Fluconazole 100 mg daily and had been on that dose for the last few months. Her chest pain was typical for cardiac, so I got a functional study of her heart. It was positive. 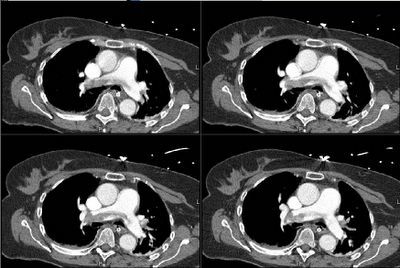 A cath was performed by cardiology and a PTCA/stent was placed in her PDA; her symptoms clearly improved. However, she was not back at her baseline. 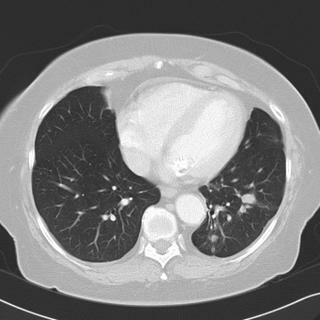 Chest CT's in the past (i.e. before her trip to Arizona) do not show any pulmonary abnormalities. She has gotten serial Chest CT's to follow her aneurysm. 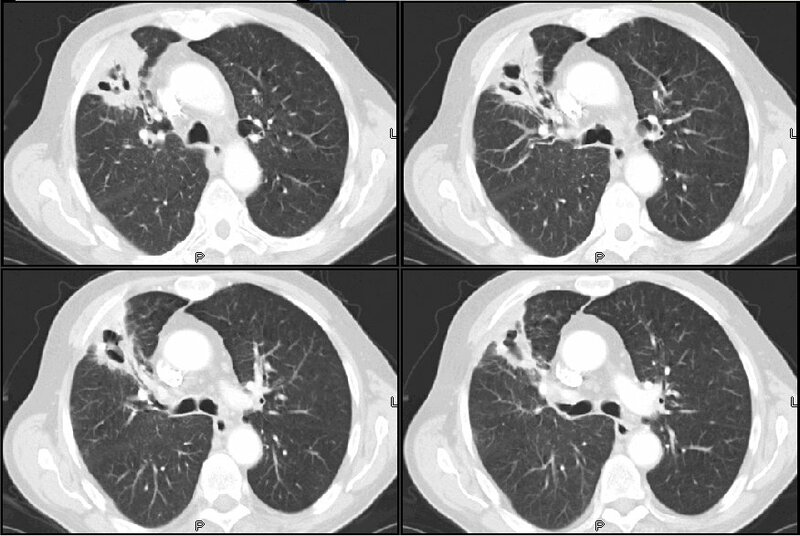 This is a 68 y/o man with COPD, still smoking with a persistent cough. No hemoptysis, no sputum production. 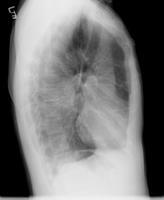 His Cxr at his PCP's was abnormal and he came to us with the following CT scan. 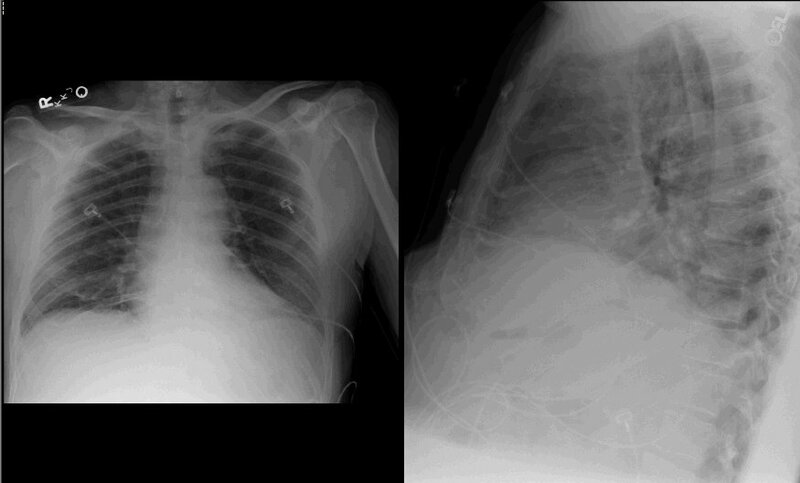 Exam showed only hyperinflation and minimal crackles in the R mid lung field. FVC is 70% and FEV1 is 54%. What is your differential and how would you proceed from here? Okaaayy...Any hoo, I guess I will post my case (is this on?). 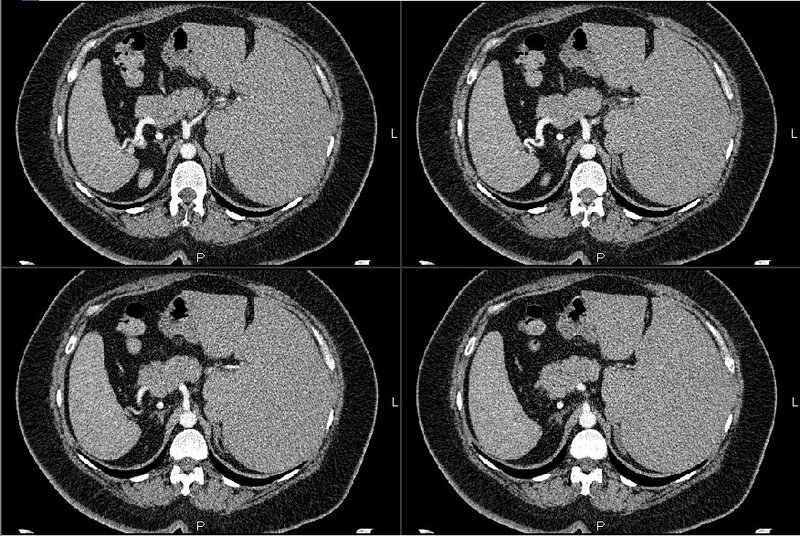 70 year old previous 30+ pack year smoker with hypertension and GERD who presented with flank pain and found to have a UTI/pyelonephritis and treated successfully with Cipro. No fevers chills diaphoresis or cough. But he did admit to a 30 pound weight loss without anorexia over about 6 months. A routine CXR showed a nodule: . A CT shown here confirms that. 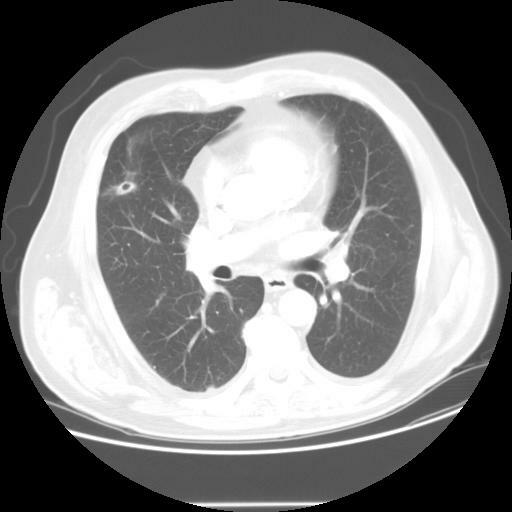 In follow up clinic a month later the CXR looked better: but a CT a month later looked like this: . What would you do next? After you read the comments, the histology (and answer) can be found here. 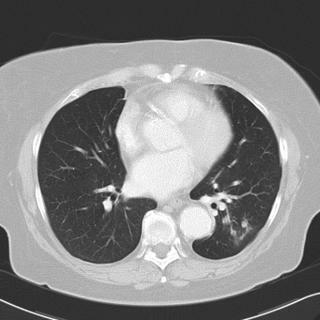 Patient is a 49-year-old woman with a history of cough thatshe noted since early May. She had traveled to Puerto Rico for 1 week and when she returned, she noticed a dry, nonproductive cough that was sporadic. No fever, weight loss or other constitutional symptoms. In June, Vasotec was held by PCP w/o any change in sxs. However, in July, she returned with continued cough and now with fevers and chills. Fevers were documented up to 102. At that time, an x-ray was performed, PA and lateral, which revealed prominent hila. This was followed by a CT scan of the abdomen and chest with IV contrast. 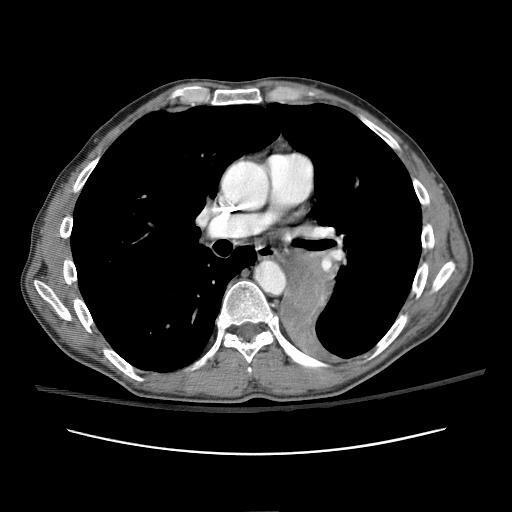 The CT scan revealed hilar mediastinal adenopathy. 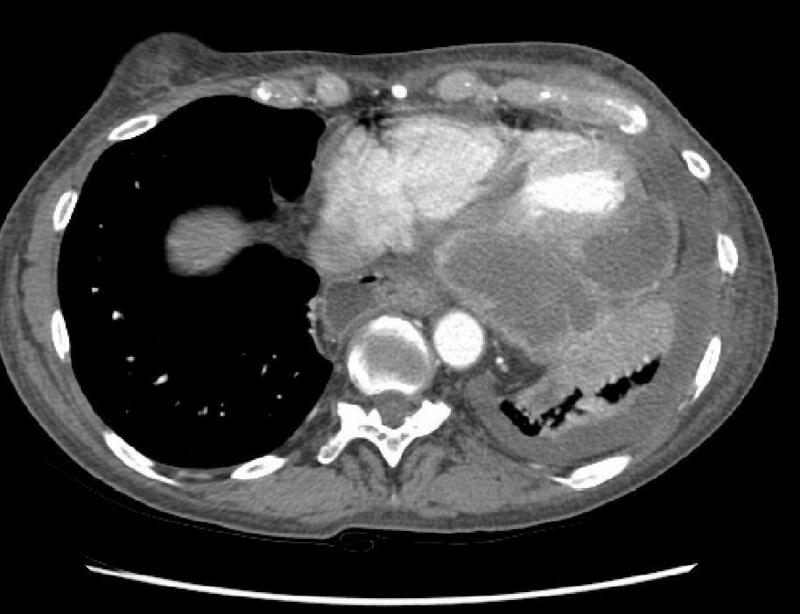 A right paratracheal node was noted to be 1.7 cm. 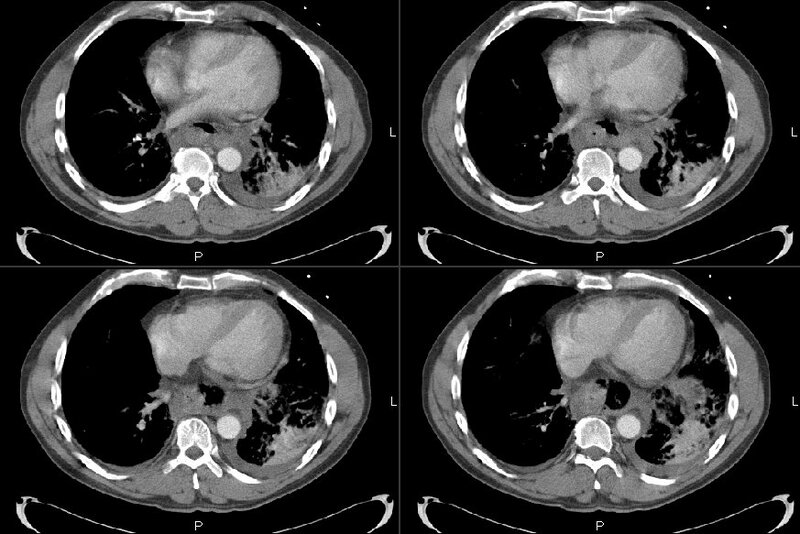 There were also non-calcified <5mm nodules noted in the right middle lobe, the right lower lobe and lingular nodule as well. She was treated with Zithromax for 5 days after which she had improvement in her symptoms - no fevers, decreased cough. She otherwise feels fine. 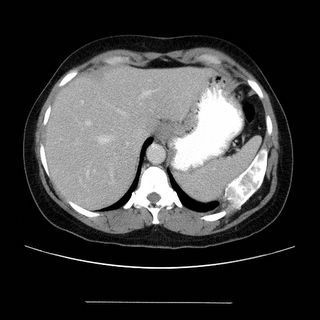 She was referred to us for the abnormal CT findings and a PPD placed 48 hours previously. On the day of visit, she continues to feel better. No history of sick contacts, swollen lymph nodes or rashes. She has not had any heartburn or any sinus problems. At this time, her medications include Hyzaar. She has no known drug allergies. Past medical/surigcal history is significant for C-section. Family history is noncontributory. Social history: She has worked in a bank and does not note any occupational exposures there. She does not have any pets or birds. She is never a smoker and is not exposed to second hand smoke. There has been no significant change in her environmentin recent time. She is from India and has not been there since last year. She has lived in the US for <20 years. She did receive a BCG when she was a child. She does not recall any TB contacts that she knows of. PPD placed 48 hours ago and this, as measured in our clinic, is20 mm x 18 mm with red induration. Data: Spirometry reveals an oximetry of 100% on room air. FEV1 is 1.95 L (74%), FVCis 2.75 L (80%), FEV1/FVC ratio is 93% of predicted. The flow-volume loopappears mildly coved. A 74y/o woman was transferred to our institution for her persistent lung abscess. 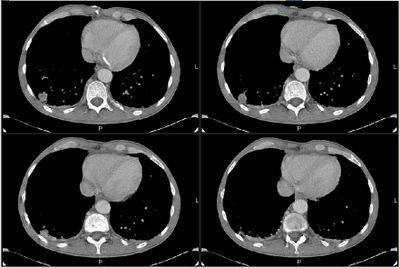 Briefly, she was an otherwise healthy woman until about 5 years ago, when she was diagnosed with a distal esophageal carcinoma, for which she underwent resection with an esophageal pull through and subsequent radiation therapy. Obviously, she did pretty well. About 6 months prior to her current presentation, a LUL nodule was found, and she underwent a left-upper segmentectomy. Following that, she has been seen for a persistent left pleural and pericardial effusions. The etiology of these remained unclear, and she was told it was a "Dressler's type of syndrome." Any comments on the CT scan? Differential diagnosis? Diagnostic studies? Answer in the comment section below. 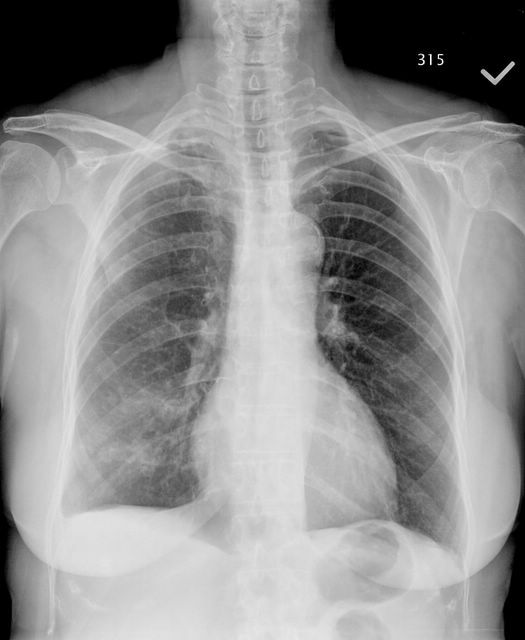 More data on "Abnormal CxR"
Good pick-up on that right sided density. Sorry, I didn't have the lateral view on the computer system so I couldn't post it. What is your differential now? Follow-up to "What would you do next?" 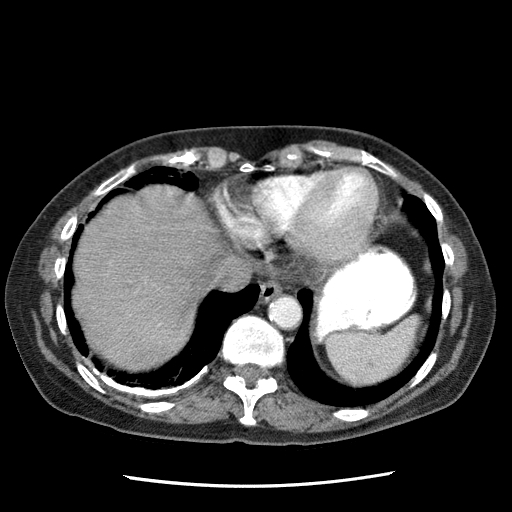 This was the patient with intracranial hemorrhage complicated by saddle embolus. She had decreased (though still present) radial pulse on the left and we found an occlusive L subclavian/L axillary arterial thrombus with collateral flow. She developed decreased mentation and though her respiratory status remained the same. She herniated a few nights ago, was made DNR and expired. What is the abnormality? And what is your differential Dx? Read the comments then see here for a follow-up. 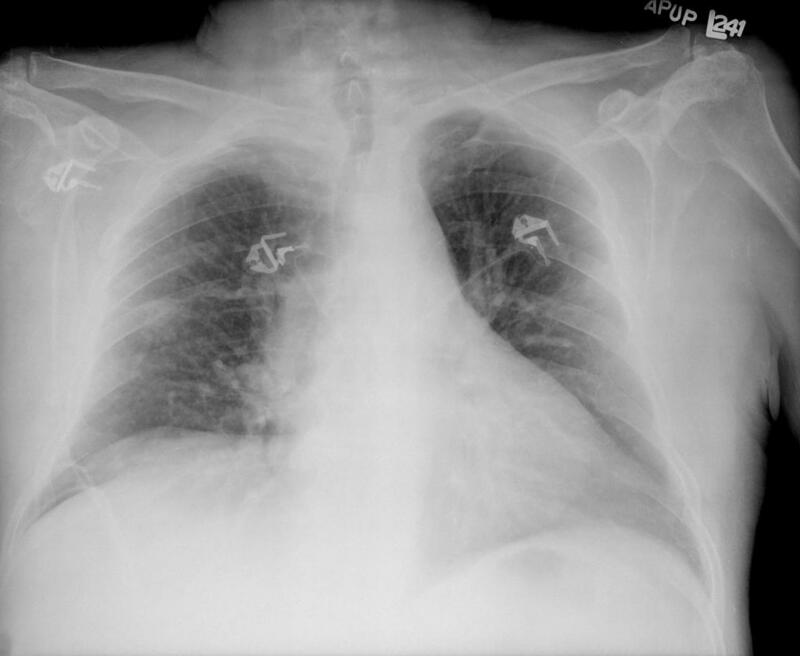 What might be the cause of the CXR findings, in the setting of this presentation? 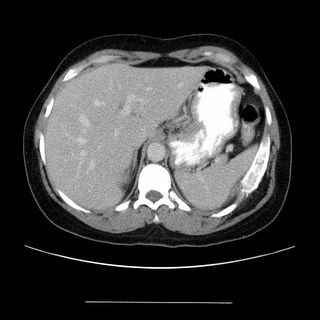 Effusion - what is the cause? 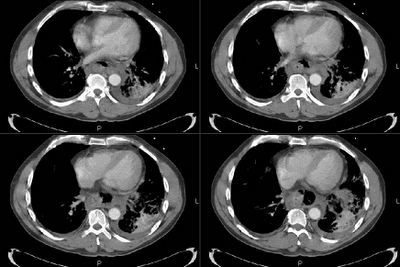 airspace disease and atelectasis and the effusion. This has come up today: we have been following this 59 y/o woman on the neurosurgery service. 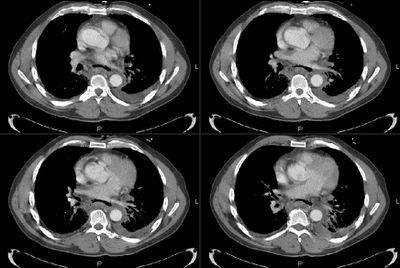 She presented with HTN crisis with a hemorrhagic CVA and has been fairly stable. She has had SCDs on. Tody she had an increase in FiO2 requirements and became more tachycardic. No hypotension. No CP. I got a CT angio that looks as follows. The follow-up to this case is posted above on this link. 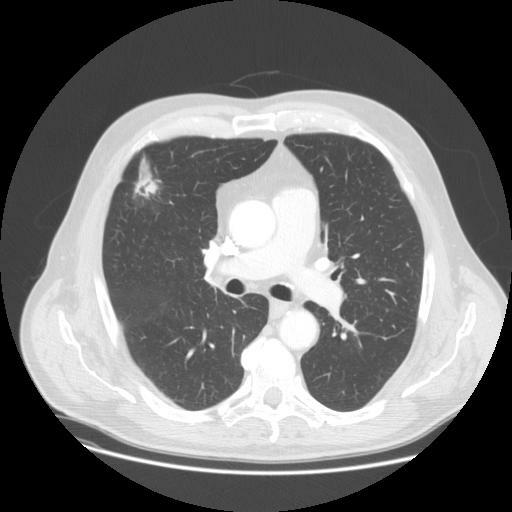 I saw a 57 year old man in Southern Delaware, referred to me for abnormal CT thorax (a pneumatocele). I noticed that his left diaphragm was elevated, and that was not the case on a previous CXR 6 years earlier. Sniff test confirmed left diaphragmatic paralysis. No history of thoracic surgery or trauma. His medical problems includes severe COPD, hypertension and hypercholesterolemia. 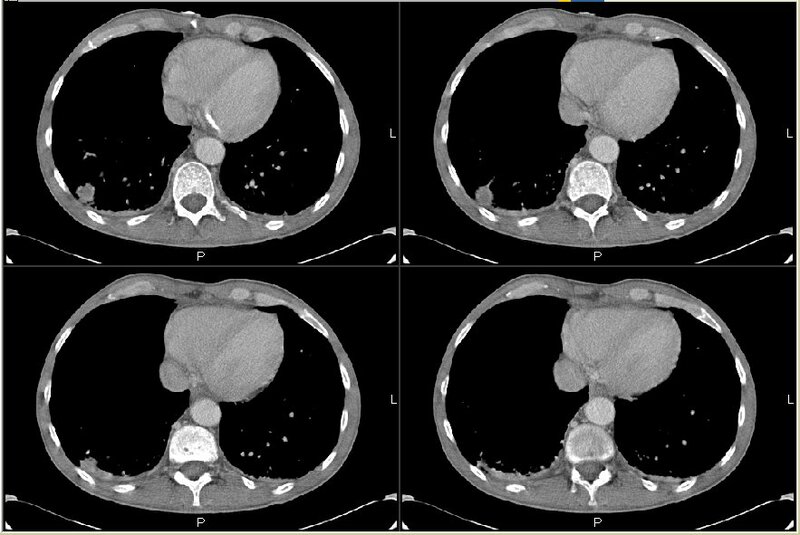 The CT thorax does not show any masses/tumors. 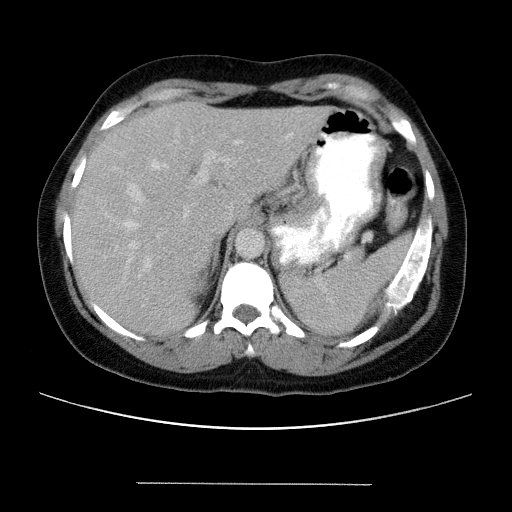 He has emphysematous changes, and calcified granulomas.What is the differential diagnosis and the next step, if any needed? 42 yo male with no significant PMH, family history or tobacco use who was his usual state of health until January of 2005. At that time, he was diagnosed with pneumonia (infiltrate on CXR). He was treated with Biaxin, but developed diarrhea; given a complete course of levofloxacin. He improved to his baseline. In March of 2005, he noted swelling in multiple joints throughout his body. The most problematic joints included his MCP, wrists, knees, and ankle joints bilaterally. He consulted with a rheumatologist and an extensive laboratory workup was ensued. He was diagnosed with parvovirus B19 and placed on prednisone at 20 mg per day. He remained on prednisone at this dose for roughly one month and was tapered off over the corresponding two weeks. In early April 2005, the patient again returned to his usual state of health; however in late April, his health worsened again. At that time, he developed Raynaud’s symptoms in his hands with ulcerations on his fingers. A biopsy was performed and he was diagnosed with a nonspecific lymphocytic dermatitis. In late April, he traveled to the Bahamas, and he gradually became more dyspneic. He returned to the continental United States and was referred to an allergist. He was placed on prednisone at 30 mg per day; a diagnosis of asthma made. In May of 2005, the patient was referred to a pulmonologist. 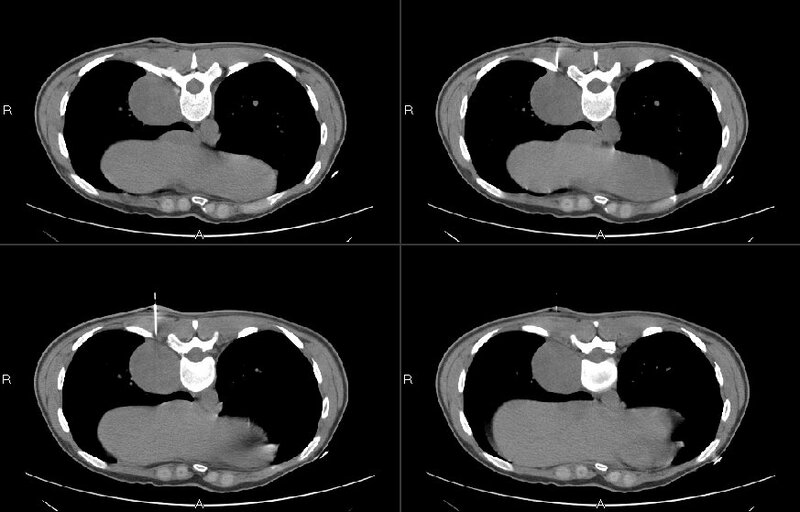 A CT scan of the chest with high resolution cuts was performed; it showed diffuse infiltrates. 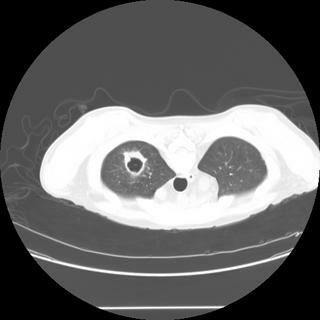 A bronchoscopy with bronchoalveolar lavage and transbronchial biopsies was performed. 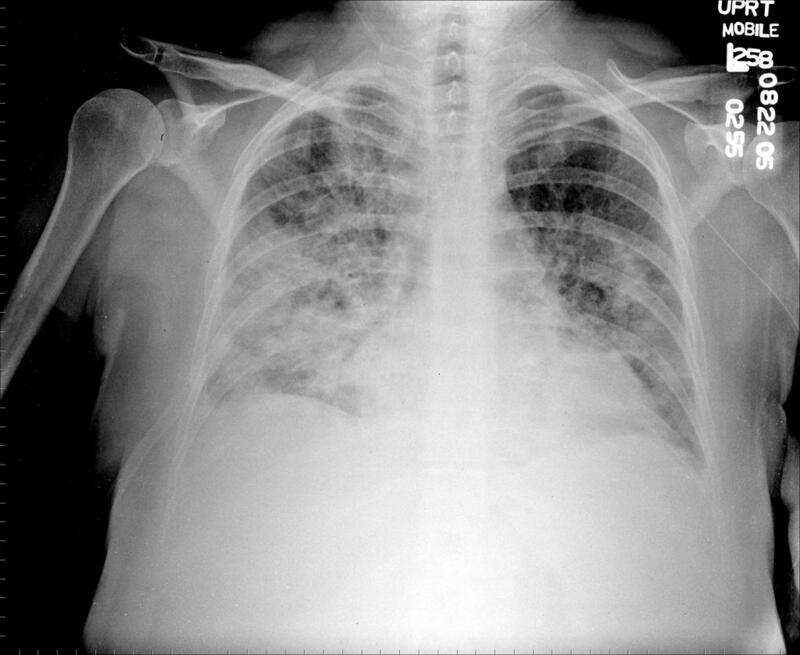 This showed a non-specific bronchiolitis. 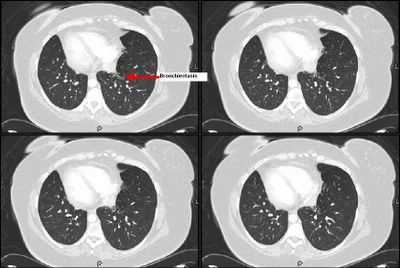 His pulmonologist assumed a diagnosis of BOOP, and increased his prednisone to 70 mg per day. Over the course of the last two weeks, he developed progressive worsening of shortness of breath. He has a cough with white sputum production in excess of 2 ounces per day. He was ultimately transferred to a major academic center to be evaluated for extracorporeal membrane oxygenation. Jennings and Horowitz asked for a CT scan on this patient so here it is. This is a 52 year-old man. 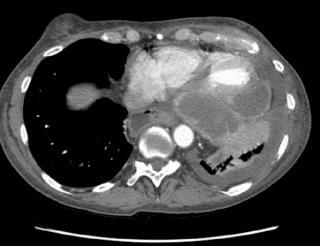 At approximately midnight prio to admission he was eating a piece of chicken on which he choked, gagged and strained and with heavy heaving, he suffered acute onset of abdominal pain and left chest pain. He presented urgently to the hospital and had the following studies. PMHx: HTN. No previous dysphagia/PUD. No label of pulmonary disease but he smoked 2 ppd. SHx: Occ ETOH, 2 PPD TOB. ROS: The time from the onset of symptoms to arrival in the ER was approximately 4.5 hours. He has had hematemesis since the onset of the event. He complains of generalized chest pain. No chronic or preceding weight loss or fever or chills, nausea or vomiting or diarrhea. On exam, he was restless, retching, blood pressure is 154/87, HR is 130. O2 Saturation is 94 to 95%. Chest had crackles and decreased BS at the base. Abdomen was surprisingly benign. What is your differential and what is the next step? CT scans added on a new post. HC from Michigan has this question: "This gentleman 4 months s/p kidney transplant complaints of shortness of breath. No sputum production. PPD negative pre-transplant. 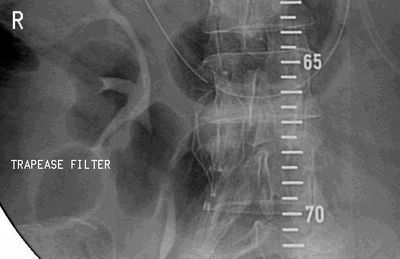 Unable to obtain induced sputums. 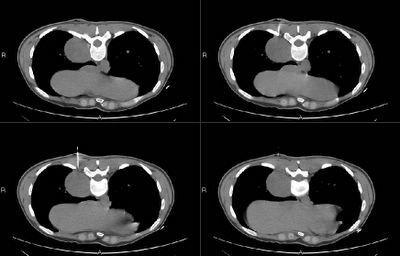 He had a CT guided biopsy (ID service, before he got to us), of the abnormal finding on CT of the thorax which is negative for AFB and other organisms. 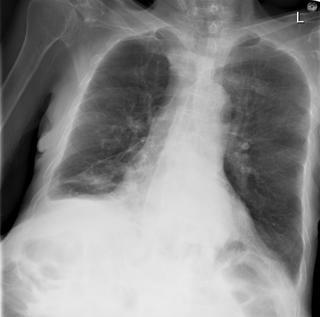 Can you reliably rule-out tuberculosis on these grounds without a respiratory sample? ; The classic thick vs thin cavity differential diagnosis, can be applied on this case? What is the next step?" This is a classic example of collapsed segment of the left lower lobe. 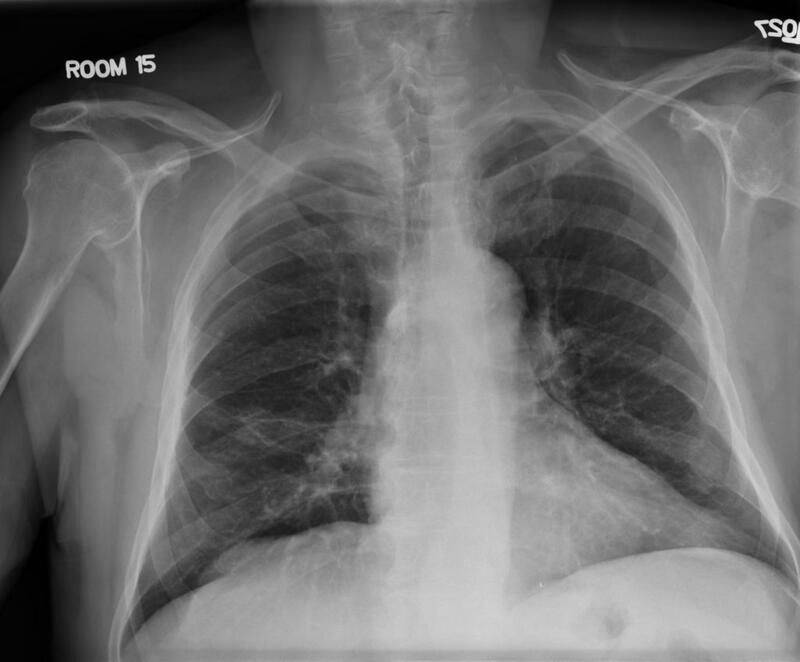 You can't usually tell which segment it is, because they will all collapse medially like that and look the same on CXR (because of the pulmonary ligament, it has to collapse that way). 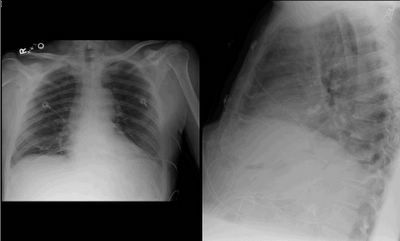 The lateral shows some haziness (red circle) and loss of left diaphragm (arrow), but no clear lines to indicate the collapsed lung edge. The PA view clearly shows the collapsed segment (arrows). The CT is shown for comparison. 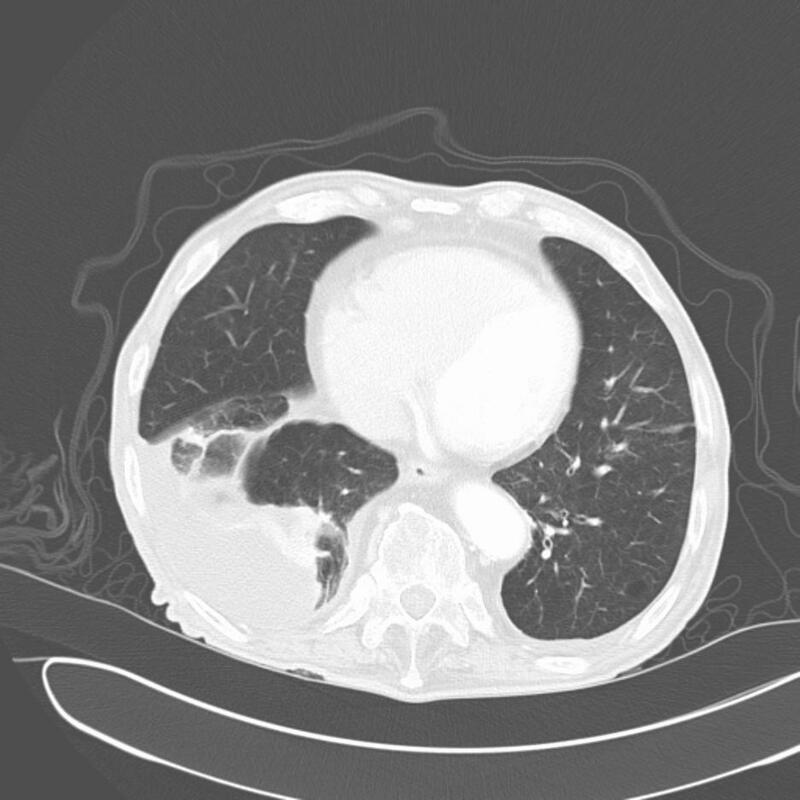 The patient ended up having an endobronchial lesion at the proximal portion of the left lower lobe. It was squamous cell carcinoma. We received this question by email. Any thoughts? "I am a private practice pulmonologist and was just detailed re: mometasone DPI. The only dose is 220 ug, but it comes in 30, 60 and 120 dose units. The company is telling us that once the DPI is removed from the foil packaging the drug expires in 45 days. This seems to be a ploy to prevent 220 ug QD use with the 120 dose unit, which would be one of the most economical ICS. I searched the web looking data on mometasone stability, and it seems to be a stable molecule. Does anyone know any data? I smell a scam." Good pick-up by Mendez. The CxR has that L for a reason. This is a new patient with Kartagener's who is establishing local pulmonary care. She has chronic sinus disease but not much in the way of bronchiectasis. Does anyone know the citation of a study showing an actual survival benefit to using BiPAP ventilation in a patient with a COPD exacerbation vs. conventional mechanical ventilation? All of the studies listed in Bart Celli's consensus states show trends to survival benefit. DM is a 43-year-old dentist who was referred to our clinic with a presumptive Dx of lupus based upon a positive ANA and a constellation of physical findings and symptoms including arthralgias and skin rashes. These symptoms began about 3 years ago. About 2 months ago, he developed persistent redness in his eyes and was seen by Ophthalmology who diagnosed episcleritis. Most recently, he was started on Plaquenil at a dose of 200 mg b.i.d. while tapering prednisone. In terms of his respiratory history, he notes that he first began experiencing fatigue and sensation of dyspnea about 3 years ago, but the dyspnea became more debilitating over the last year. He is an avid gardener and notes that each summer, it has become more difficult to perform his usual activity. He otherwise is not complaining of any chest pain, any inspiratory or expiratory pain with breathing, cough, fevers, or night sweats. Medication list includes atenolol 50 mg p.o. daily, tramadol 50 mg p.o. daily,clonazepam 1 mg p.r.n., Clarinex 5 mg p.o. daily, Celexa 40 mg p.o. daily,Nasonex 50 mcg b.i.d., Lotemax 50 mg b.i.d., triamcinolone cream p.r.n.Albuterol prn. Allergy shots every week. Social History: Quit Tob 4-1/2years ago. Physical exam: his weight was 192, blood pressure 120/85, pulse 104,respiratory rate between 12 and 15, oximetry was 97% on room air. No apparent distress at rest. 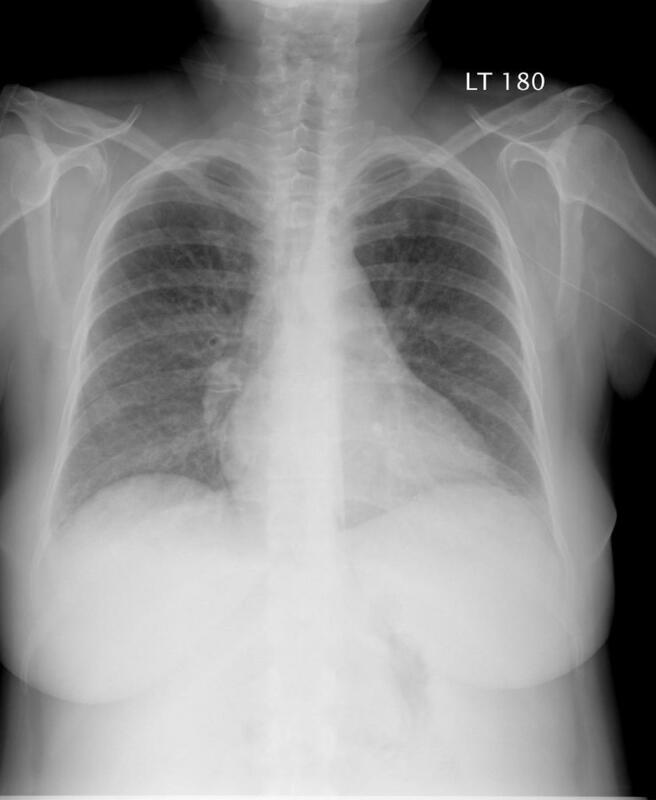 Lung exam revealed normal symmetrical excursion. Normal palpation and percussion. Auscultation revealed clear lungs without wheezes, crackles, or rhonchi. There is no forced expiratory wheeze. Heart exam revealed normal S1 and S2 without gallops, murmurs, or rubs. Extremities revealed no cyanosis, clubbing, or edema. Data: Spirometry performed today reveal an FEV1 of 1.4 liters (55%), FVC of2.33 liters (54%), and FEV1/FVC ratio is 92% of predicted. Full pulmonary function tests recently performed revealed the following:A total lung capacity of 74%, residual volume 74%, FEV1 of 2.5 liters, 74%predicted, FVC of 3.1 liters 72% of predicted. He was unable to perform DLCO. 1. Normal cardiomediastinal silhouette.2. Mild hypoinflation3. Lungs are clear with no evidence of abnormal opacities and nopleural effusions4. 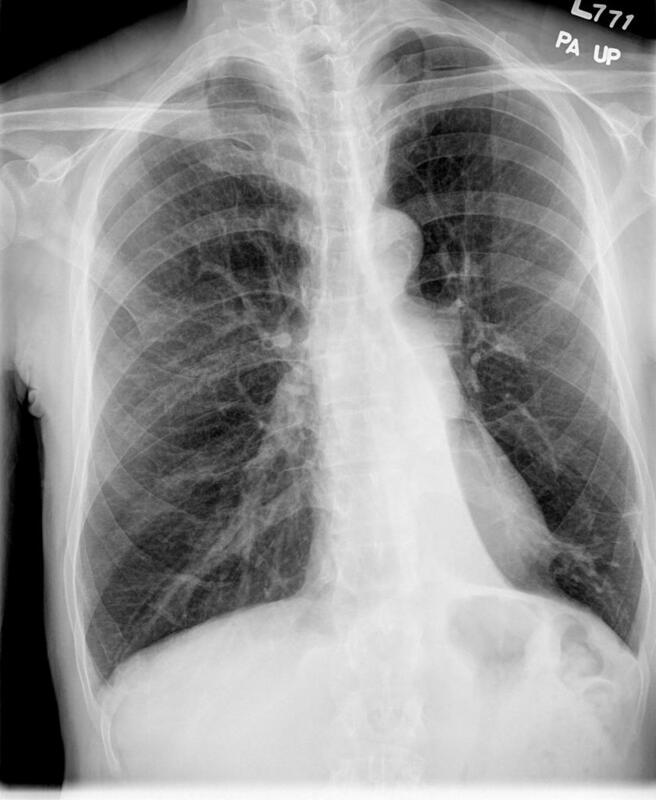 Normal bony structures of the chest5. A focal sclerotic lesion in the head of the left humerus, likelyrepresenting simple bony island. 1. Minimal linear left basilar atelectasis. Lung volumes are somewhatunderinflated. Otherwise, no acute cardiopulmonary process. I will wrap this one up so we can focus on JCH's and MLazar's postings. This is mixed fungal and bacterial endocarditis. Though Candida is a concern and has a fairly high mortality, Aspergillus is the second most common cause of fungal endocarditis and has a very poor prognosis: mortality for treated Aspergillus endocarditis is usually ~80%. The cytology smears were typical of Aspergillus... We started therapy with Vanco (as suggested by JCH I think), gent and Rif (since he had a new prosthetic valve) as well as ampho B and Cancidas. I did not find good data on "double-coverage" for Aspergillu but it has such a dismall prognosis there are many case studies and small series review using Ampho and Voriconazole or Cancidas. Here's a quick one: 78 y/o man presented to my clinic with the question: can we remove my trach? Actually, he doesn't speak English, and the entire history (or what I could get of one) was provided by his family. Here's the story: He had a presyncopal episode several months ago and was admitted to another hospital. 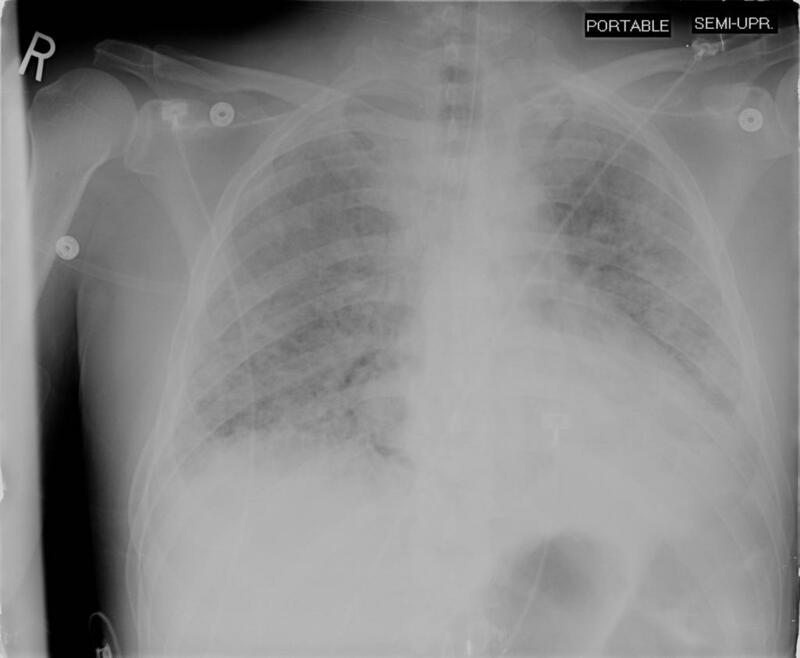 Developed respiratory distress that night, and was intubated. I have no idea why, but the family says he had been getting narcotics for pain related to the foley (which was placed because he was severely hyperglycemic-known diabetic). Anyway, he self extubated a day later, and required reintubation with 30 minutes. There was apparantly a question of airway edema. A trach was placed 1 week later (no other attempts to remove the tube), and he was discharged to a rehab facility (he was off of the vent). There, his trach was downsized from an 8 -> 6 -> 4. With the #4, he developed respiratory distress (family things it was a mucous plug). The staff took out the #4, but were unable to get a larger trach in, so he was orally intubated again. A repeat trach was placed 2 days later, and he was in the ICU for 3 weeks (again, I get no history of a pneumonia or mechanical respiratory failure, but I'm told he was on the vent for most of that time) prior to transfer back to rehab. He was in rehab for 2 months, and now home for 1 month. He's got an uncuffed 6-shiley and caps it without difficulty. He's got a Passey-Muir that he uses to speak with family. Only other PMH is multi-infart dementia. The rest of the history and exam are unremarkable. Spirometry shows a fixed obstruction-classic-if anyone wants it for their teaching files, let me know. Anyway, what do you tell them? Can we decannulate? 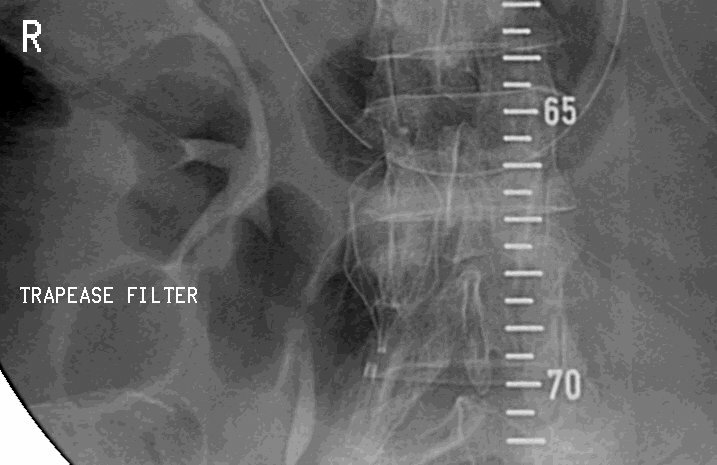 81 yo male with a past history of obstructive jaundice s/p ERCP and removal of a stone one week prior to readmission. He was discharged from the hospital shortly after this procedure at which he was returned to his care facility for two to three weeks. While at his NH, he started to have worsening shortness of breath which has worsened over the last 2 months but has become more profound in the last week. It is worse with exertion and he can currently only walk approximately 10 feet. He denies any complaints of chest pain, calf pain or calf swelling. He has no history of venous thromboembolic disease. The patient denies wheezing, cough or sputum production, hemoptysis, a runny nose, reflux symptoms or palpitations. PAST MEDICAL HISTORY: Obstructive jaundice secondary to gallstones; COPD per his PCP's records. SOCIAL HISTORY: Smoking history: 20 pack years; he quit 15 years ago. Alcohol use: The patient admits to 6 to 7 beers per week for approximately 60 years. He denies IV or street drug use. He was exposed to asbestos for approximately 7 months as he was working in a factory in which the asbestos was being removed. No travel. PE: Vitals: Heart rate 76, resps 18. BP 136/76. Saturation: 96% on Room Air. Neck: No JVD. Heart: Normal. Lungs: clear throughout all fields, however, decreased BS in all fields. Extremities: Fingernails positive for clubbing. Pitting edema noted in the lower extremities. Labs: Sodium 142, potassium 4.3, chloride 110, bicarb 23, BUN 6, creatinine 1.0, glucose 98, calcium 8.2, phosphorus 2.7, albumin 2.3, total protein 5.0, alk phos 151, AST 26, ALT 38, total bili 3.5, direct bili 1.8.
white blood cells 8.6, H and H 9.4, and 29.7 platelets 771. How would you proceed? What tests would you want next? Has anybody used or had any experience with the new mometasone inhaler (Asmanex)? It comes in an auto-haler similar to Pulmicort but it has a counter which is a nice improvement over Pulmicort. Just a quick question while we are all mulling over Carlos' post; if a patient had resection of some RUL aspergilloma and he is going to get a renal transplant (thus immunosuppressed), do you give that patient prophylactic itraconazole after the kidney transplant? 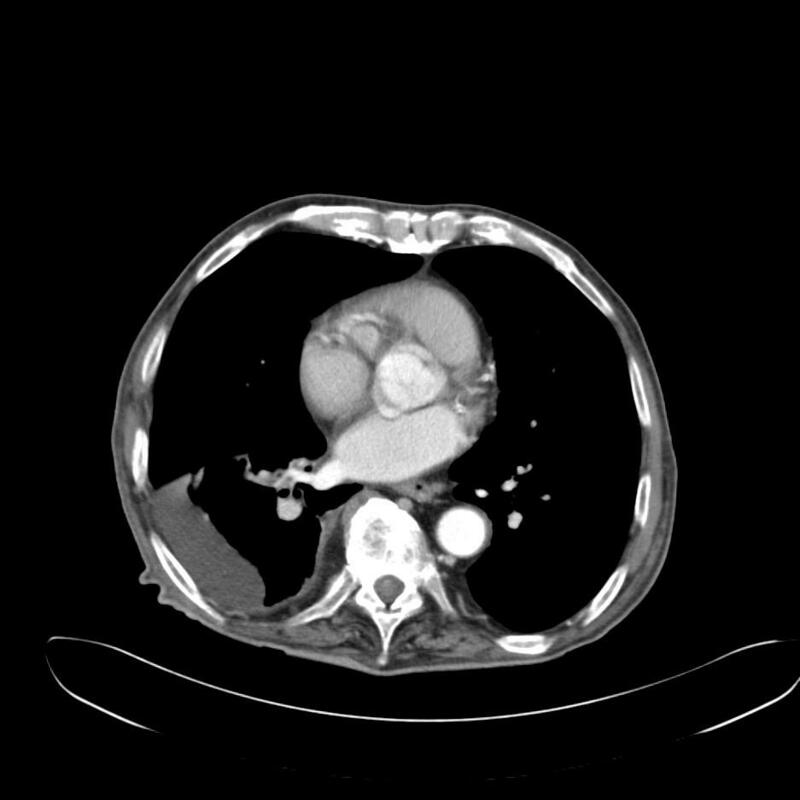 We were consulted to see this is 72-year-old man following emergent aortic valve replacement. 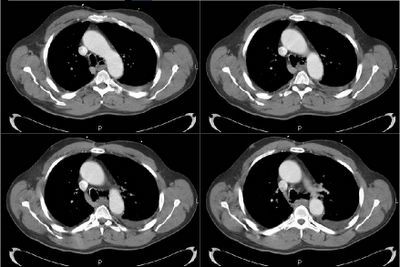 He had had a CABG in 2000 and ha done extremely well until approximately two to three weeks PTA when he began experiencing increasing shortness of breath and dyspnea on exertionre. He was seen by cardiology and a 2-D-ECHO revealed aortic insufficiency and possible signs of Valsalva to left atrial fistula. He had an emergent valve replacement and we were consulted because the valve appeared grossly infected and intra-op swabs revealed GPCs in chains and yeast on smears. He was intubated and on pressors post-op. What would you like to know and what ABTx would you recommend? 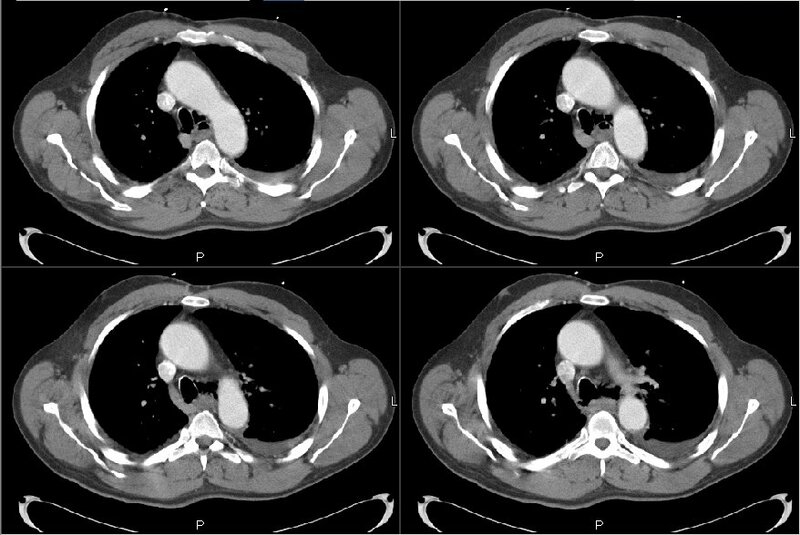 This is the 61 y/o man with a pulmonary mass and the bony lesions that Jennings astutely thought looked like a plasmacytoma. I was also impressed by the combination of lung mass and hypercalcemia. 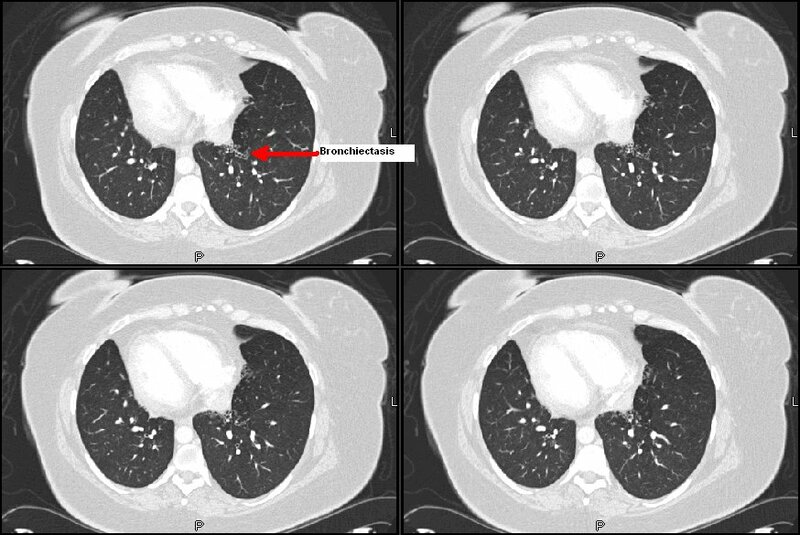 There were no other thoracic lesions. We started standard hyperCa++ treatment, his MS improved and his creatinine came down from 2.0 to o.8 with normalization of his Ca++. He recovered and prior to re-Bx'ing we repeated a CT scan and the nodule was gone! He went home to recover from his respiratory failure and we finished his w/up as an outpatient: no more lung masses but his bone lesions and BM Bx led to a diagnosis of multiple myeloma. Here's a smoker with COPD. Match the abnormality seen on both CXR and CT.
"Hello. Great blog. We have a patient with an extensive DVT. He is being heparinised. He asked if he should walk on it. Is there a risk of embolization events if you walk on a leg with DVT? If so, what is the time frame in which it becomes safe to do so? On the other hand, is it better or worse to keep the leg up and stay in bed? This would seem counterintuitive to virchow's triad which warns agains immobilisation." A 3rd year resident had an interesting question. He wanted to see what others thought. He asks, "we are all taught that bacterial pneumonia is not 'catching'. You can put a patient with community-acquired pneumonia, i.e. strep pneumonia, in the same room as someone else and their roommate will not catch pneumonia. 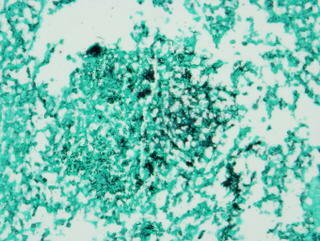 Why then is TB contagious, when this is ALSO a bacteria? Or to put it another way, why is TB the only type of bacterial pneumonia that is contagious?" This is a 61 y/o man with a significant Hx of smoking. He presented to our ER with a 3-week history of polyuria, weakness, fatigue, confusion and abdominal pain. Using my keen diagnostic skills I asked the ER to check a calcium level which was 15.2. He was admitted and treated for the hypercalcemia. 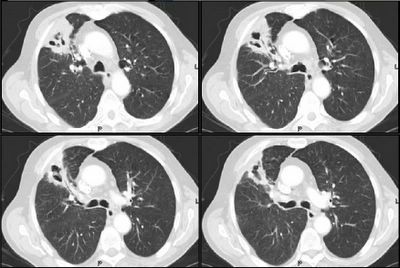 His Cxr showed some hyperinflation and a RLL pulmonary nodule better characterized on the CT scan below (check out the vertebral bodies). What would you do next? What is your differential? 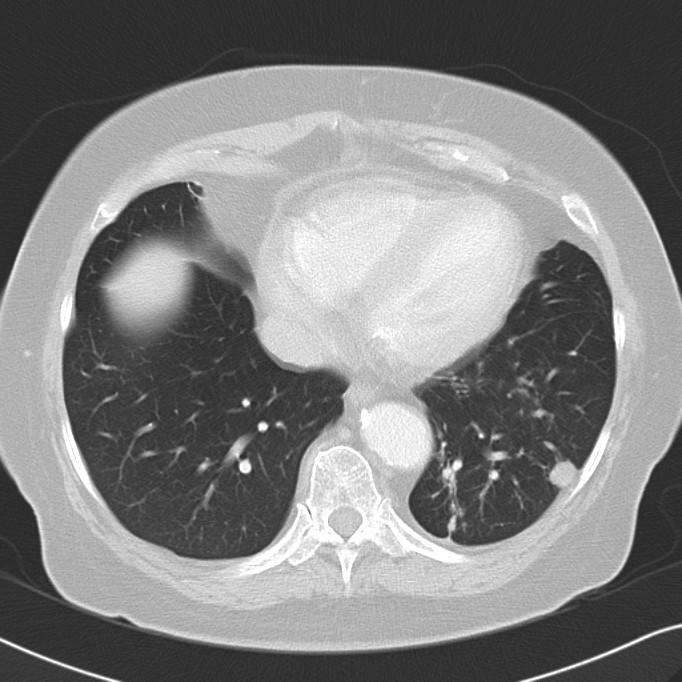 A f/u CT was done on a patient 1 and 1/2 months after RUL community-aquired pneumonia. noncalcified granulomas or intrapulmonary lymph nodes." 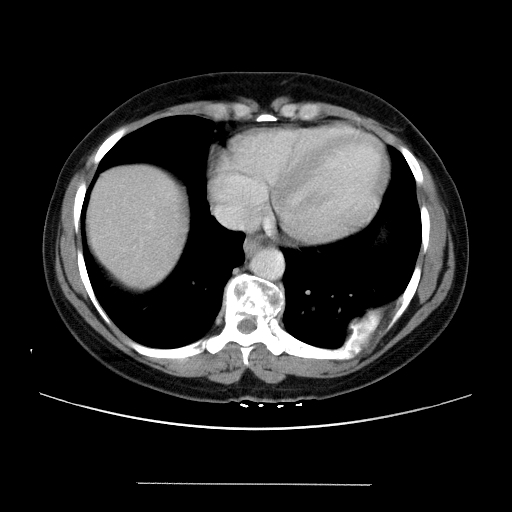 Does this patient need any more f/u CT's based on thsi interpretation? 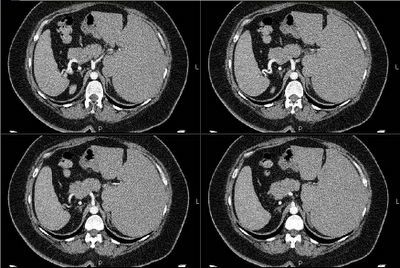 Here's an interesting case of a 42 y/o with minimal PmHx. She has a history of htn and bronchitis. She had some back pain so they ordered a CT.